I really love this picture in todays’ Sun from this week’s Ryder Cup in Ireland – it’s not that often in celebrity life that you see genuine emotion and warmth. 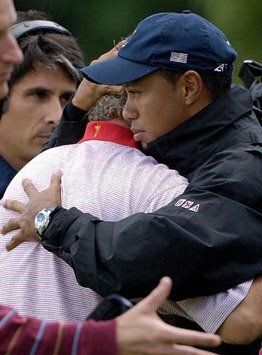 Darren Clarke and Tiger Woods are golf circuit friends and this is the moment Clarke wins the Ryder Cup – below is the moment they first meet following the death from breast cancer of Clarke’s wife, Heather. I made a 4-minute documentary recently on Channel 4’s FourDocs exploring the notion of human warmth, community and connection called Spark. Creativity is in my view an essential ingredient of Happiness so it will be a common theme in this blog – be it music or art, film-making or interactive media, it is rich in Simple Pleasures. The other day I was at a talk by Matthew Bannister, formerly of Radio 1 and golden age GLR, on Creativity at the Rich Mix centre in Bethnal Green Road courtesy of Jez Nelson and Somethin’ Else. I think I’ve taken a few creative risks in my time – most appropiately with MindGym. 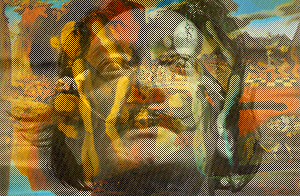 My current commission, the mobile blogging bit of the Big Art Project, is fairly against the grain, I’ve had to fight hard for it so far – can’t wait to get motoring on it with Alfie Dennen and co.
OK, so here’s my Big Theory on Creativity, inspired by Andre Breton and the Surrealist Manifesto – one of the few useful things to come out of a Modern Languages degree. Creative energy comes from bringing disparate things together and trying to get a spark (etincelle) to jump (jaillir) between these two poles, things that don’t ordinarily belong together. Bread rolls and feet in Chaplin’s The Gold Rush. Narcissus and an egg in Dali’s painting. A mouldy spillage and fighting bacteria in the case of Alexander Flemming. Hollywood movies and implementing ideas in that lost gem The Green Movie – a connection inspired by Elmore Leonard’s Get Shorty. It’s all about making the Spark fly.